Relax on the shores of Port Ludlow, endulging in nature's beauty. Port Ludlow Marina, Latitude 47. 55.30′, Longitude 122 41.10′, welcomes you to the pristine shores of The Resort at Port Ludlow where guests and residents enjoy the best of waterfront resort activities and living. With 300-slips and accommodating vessels up to 200′, the marina is perfect for a yacht club cruise, rendezvous, or getaway. Our goal is to provide an experience that will make us your favorite Puget Sound port of call. Below are some of the amenities that you’ll find at the Marina. Electricity 30 amp $5.00 per night or 50 amp $10.00 per night. An additional DNR fee of $.40 cents per foot will be charged monthly. Rates are based on size of vessel or slip whichever is greater. Overhang rates are charged at $7.00 per foot. Experience and explore the scenic and beautiful views of Port Ludlow from the water with one of our watercrafts available for rent. Cruise the pristine shoreline and enjoy seals and bird-life in a protected bay with no boat traffic over 5mph. Our Tower SUPs are inflatable allowing you to take your rental on the road or water and are ideal for a vacation or day trip on your favorite body of water. These inflate and deflate in 10 minutes and can be easily stowed in your car or vessel. Our stable 1 & 2 person Wildness System kayaks are extremely seaworthy‚ comfortable and very easy to paddle. Four hour rental receives one hour free. Our aluminum skiff is perfect for voyaging around Ludlow Bay. The skiff is equipped with a 6hp Yamaha outboard engine and can hold up to 4 people with a 500lb capacity. The aluminum skiff must stay within Ludlow Bay. Our 16’ fiberglass runabout has 70hp Yamaha outboard engine. The runabout can voyage as far as the Hood Canal Bridge to the east and Mats Mats Bay to the north. The runabout can hold 5 people with a 700lb capacity. 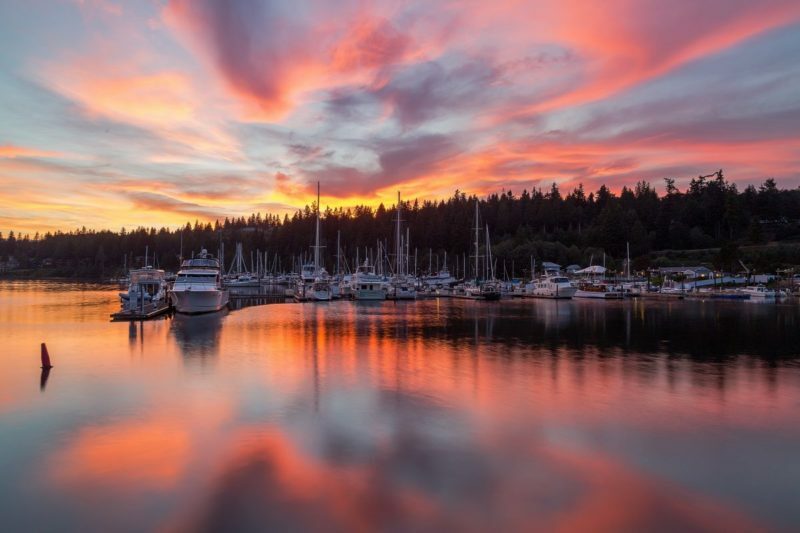 Port Ludlow Marina is a perfect location for Yacht Club Cruises and Rendezvous. Centrally located from the North and South Sound, Port Ludlow is easily accessible and can accommodate 60 – 70 vessels. Come enjoy the magic of the Pacific Northwest and the spectacular views from our beautiful bay. Click here for more information or call Kori Ward at (360) 437-0513 or email kward@portludlowresort.com. View our 2018 Rendezvous and Yacht Club schedule.